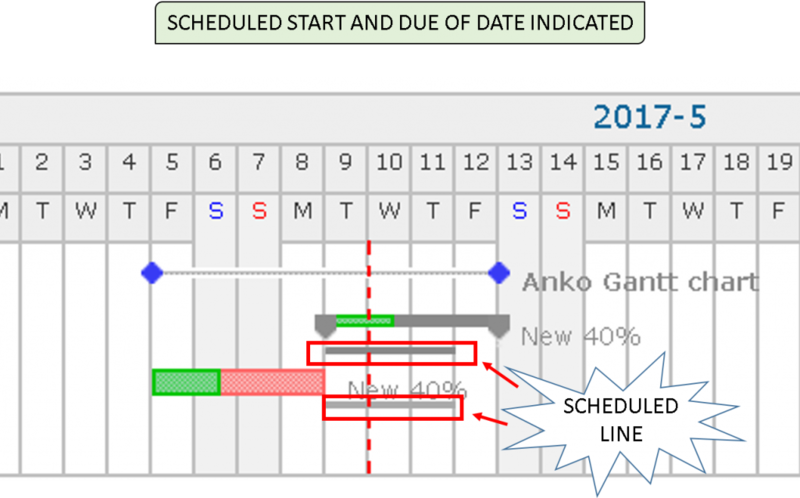 By using ANKO Gantt chart, You can improve the efficiency of the work. Didn’t you think that using Redmine Gantt chart is something troublesome or inconvenient? 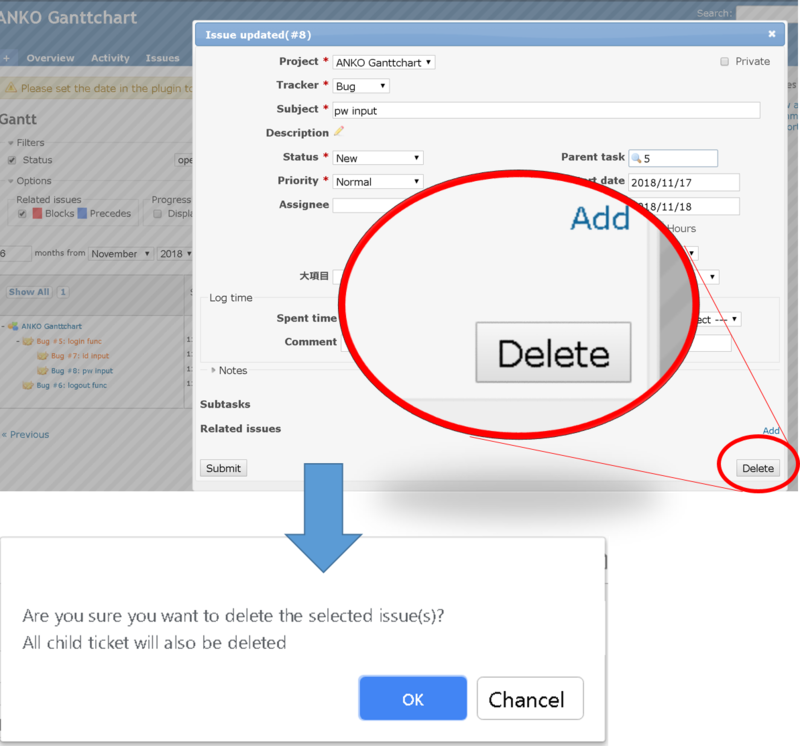 There are no edit function, but only view functions in Redmine Gantt chart, so when you want to create or correct an issue, you should move another page form there. That had very low efficiencies. 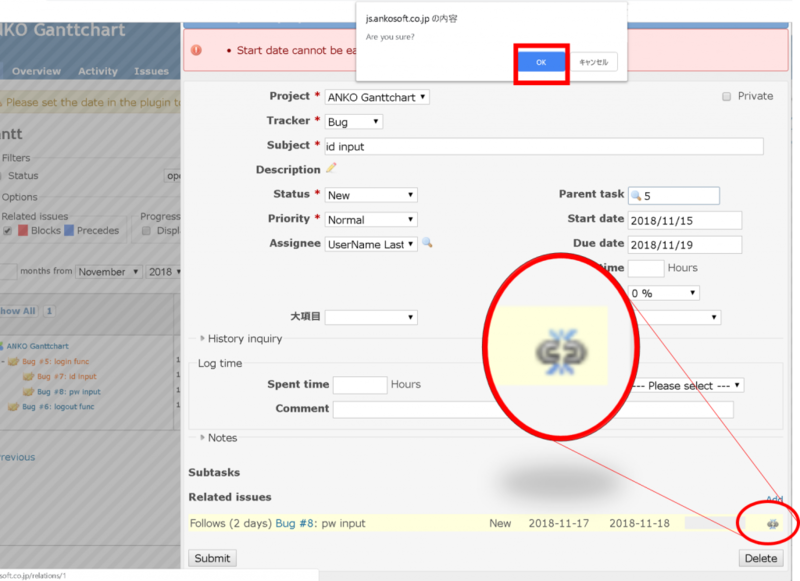 ANKO Gantt chart is the plugin to add creating and editing function to normal “Redmine Gantt chart”. 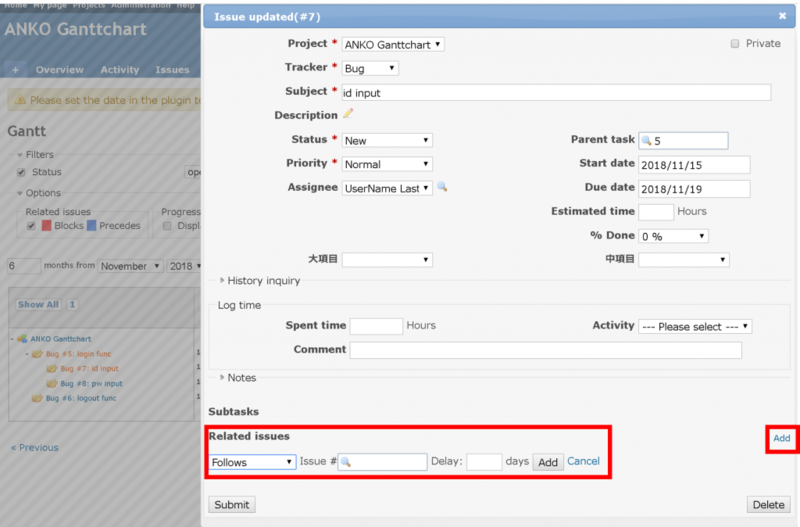 You can use ANKO Gantt chart to create a WBS very easily, intuitively without moving from a Gantt chart page. 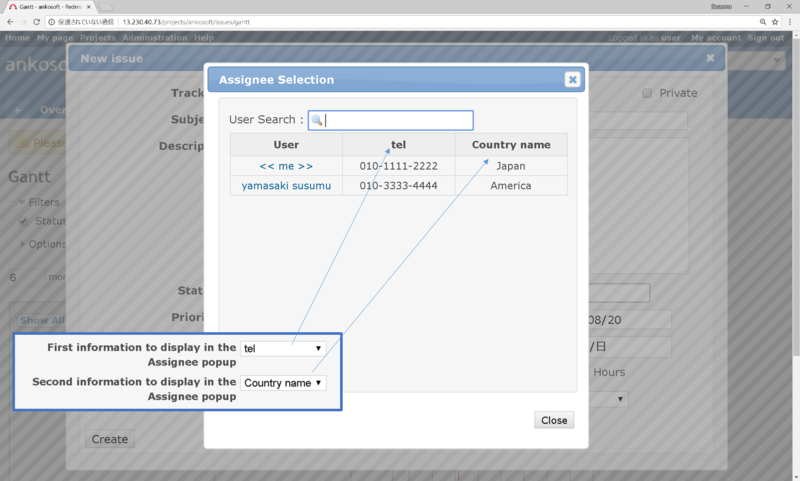 You can register WBS, Schedule management easily without any stress. 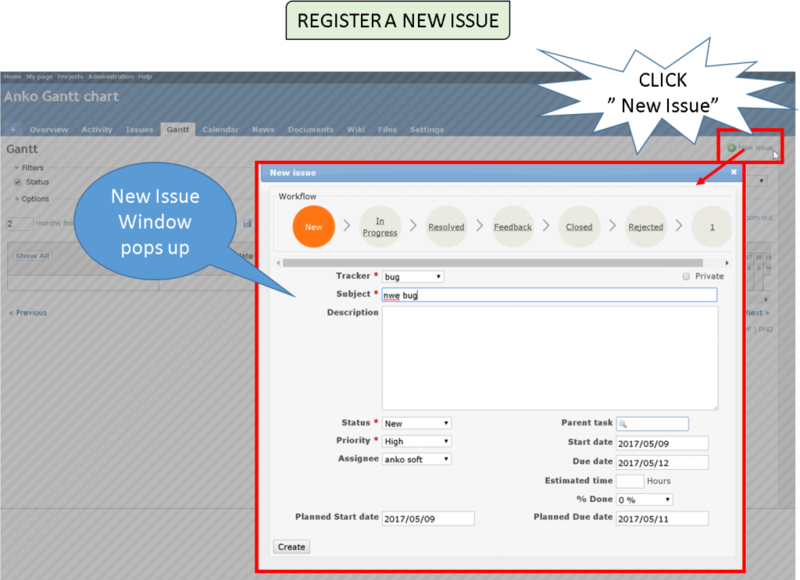 When you click “new issue” in Gantt chart page, you can register “new issue” on the same page-Gantt chart page. You can quickly and efficiently register a new issue by checking a Gantt chart. 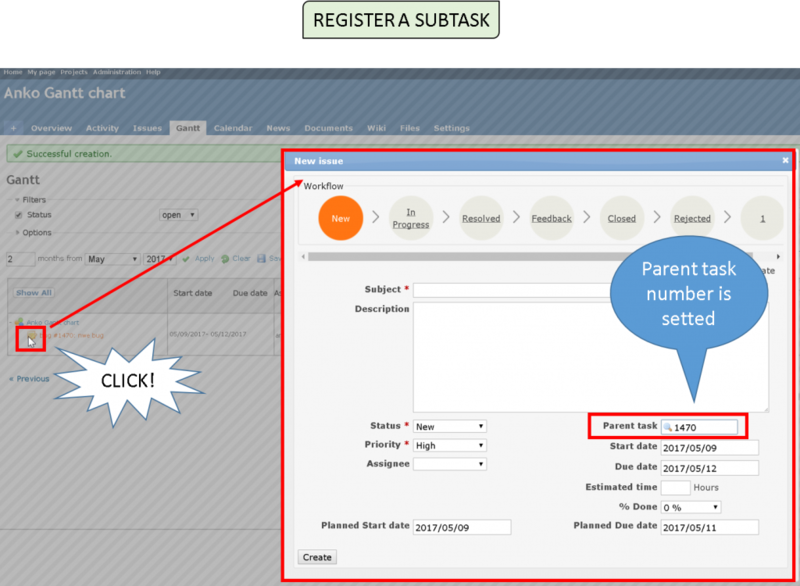 When you click the “To register subtask” icon next to the issue name, you can register “subtask” on the same page (Automatically, the parent task number is put in the Parent task Field). 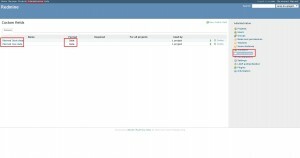 You can register a hierarchical issue like as WBS efficiently, because you can register a subtask immediately while checking the Gantt chart. 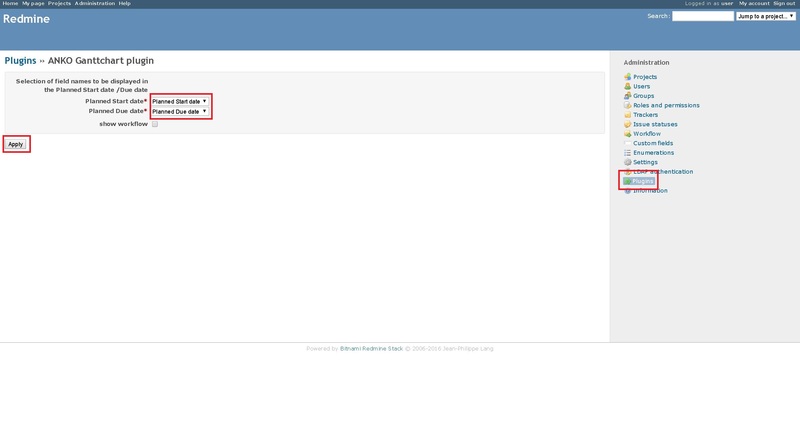 You can change the issue(title, contents, status and the related issue etc) by clicking the issue title. 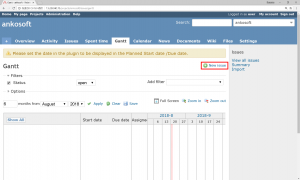 You took time and effort to change the issue continuously in Gantt chart page of Redmine, because you should move to the issues detail page to change, after registering, you have to move to the Gantt chart page once again. But if you use ANKO Gantt chart, you can change the issue only in Gantt chart page, so you can operate intuitively. 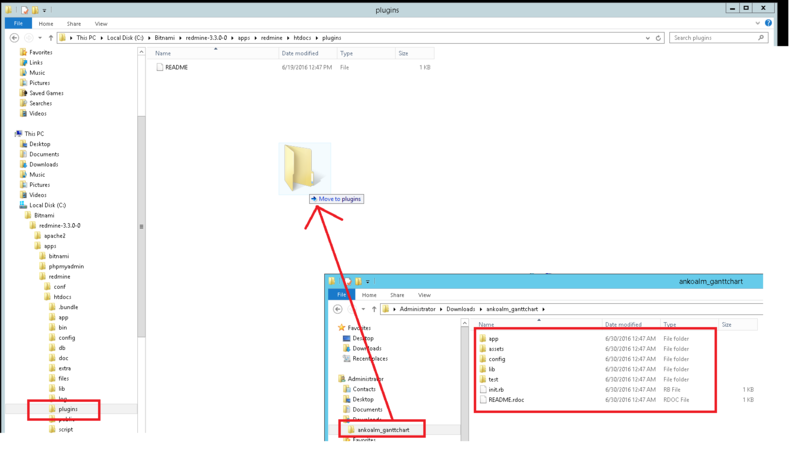 Click “Delete” on the Issue edit popup window. 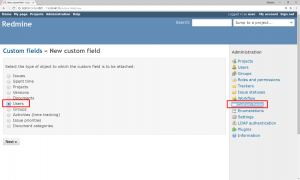 Click “OK” on the confirmation screen to delete the Issue. 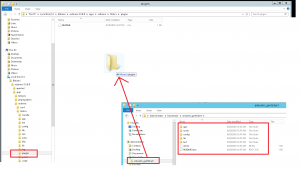 Click “Add” on the Issue edit popup window. You can set related Issues. Click on the icon( ) to chancel related Issues. Click “Notes” on the Issue edit popup window. You can input Notes on the text box. Click “History inquiry” on the Issue edit popup window. You can check the History of Issue. 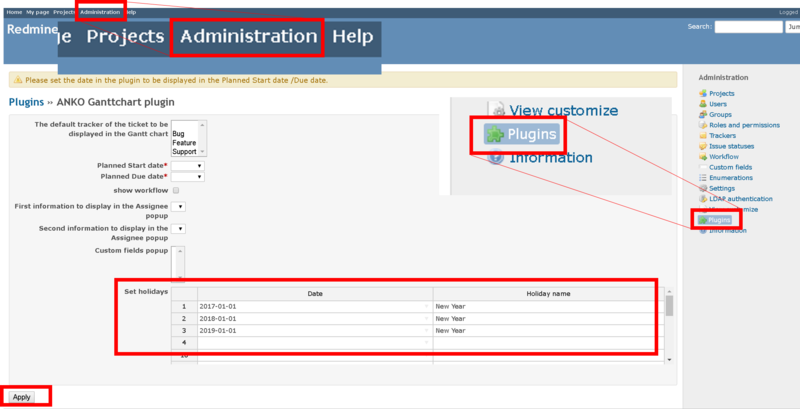 Start and Due dates are shown at right of the issue name to check Start and Due dates. So it’s very convenient. 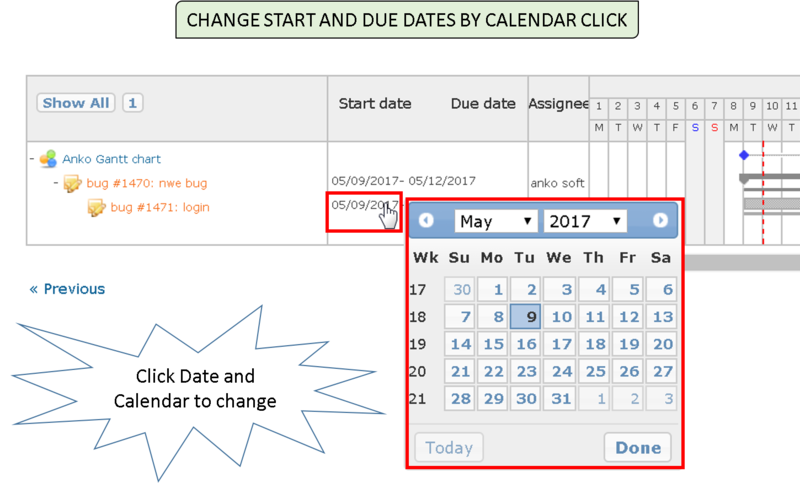 When you click the Start dates or Due dates, you can change it by click the calendar. You can change easily the schedule of an individual issue, even a lot of changes in the schedule. 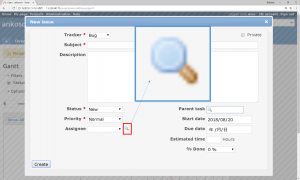 Because changed Start and Due dates are reflected in Gantt chart immediately. 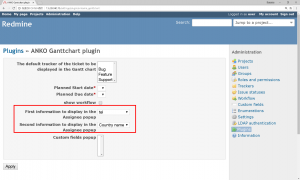 You can change the date of the Gantt chart with the mouse drag. 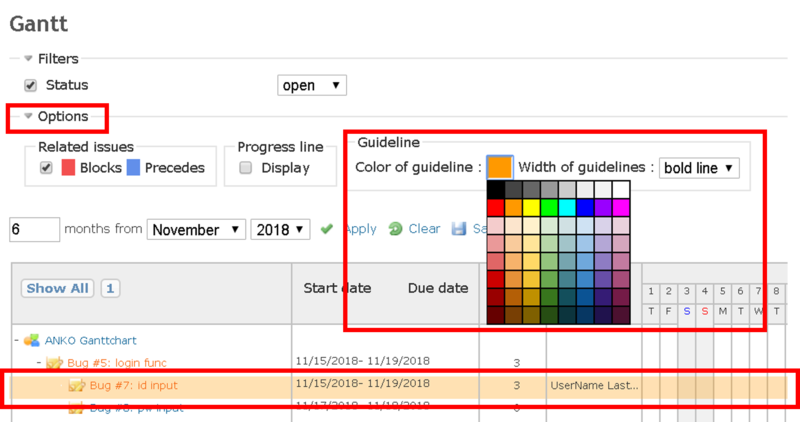 While dragging the Gantt chart, the color of the Gantt chart is changed to transparent color, so you can easily compare with the original Gantt chart. 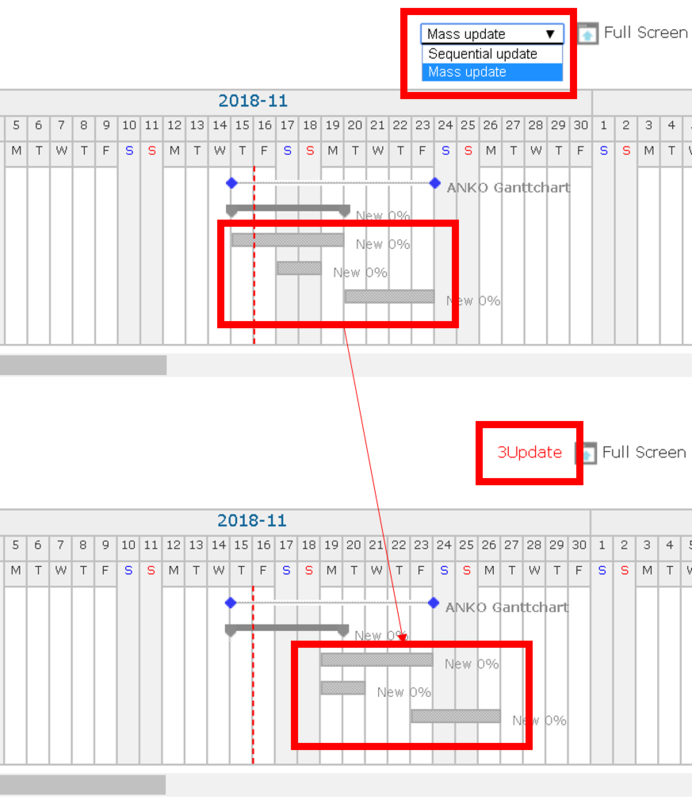 You can move Gantt chart side to side, or change the width of it. 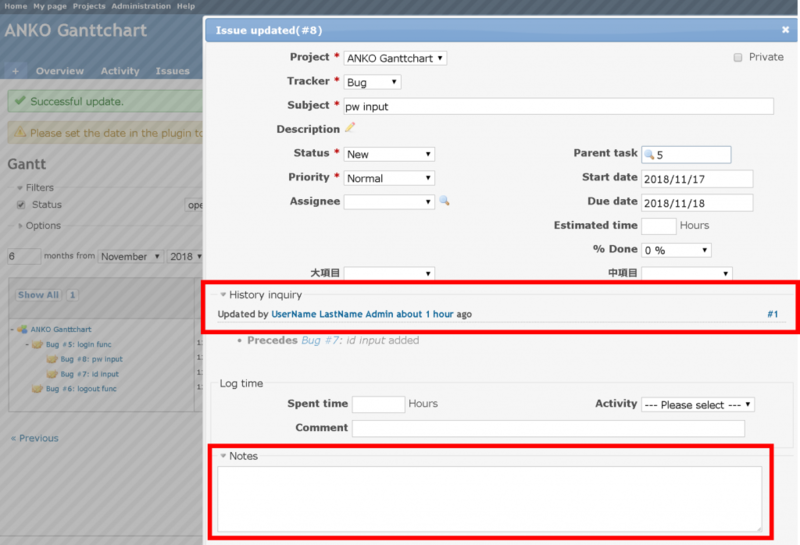 To use this function, it is necessary to zoom the Gantt chart until the day of the week is displayed. It is possible to improve work efficiency and to suppress unnecessary log generation by collective Mass update function. 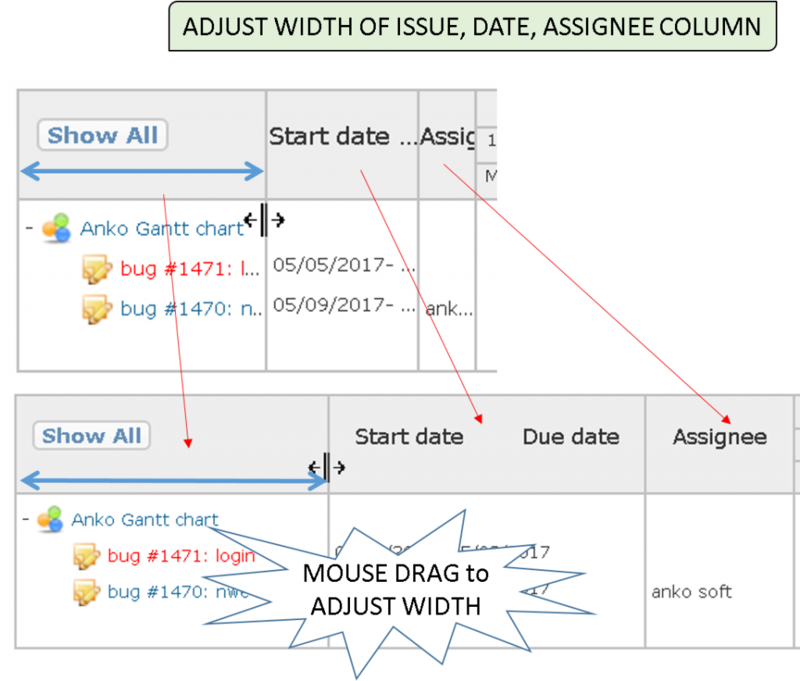 After selecting “Mass update”, dragging the Gantt chart mouse will not refresh the page, it will show how many changes to the information until now. When clicking “## Update”, Gantt charts is updated all at once. 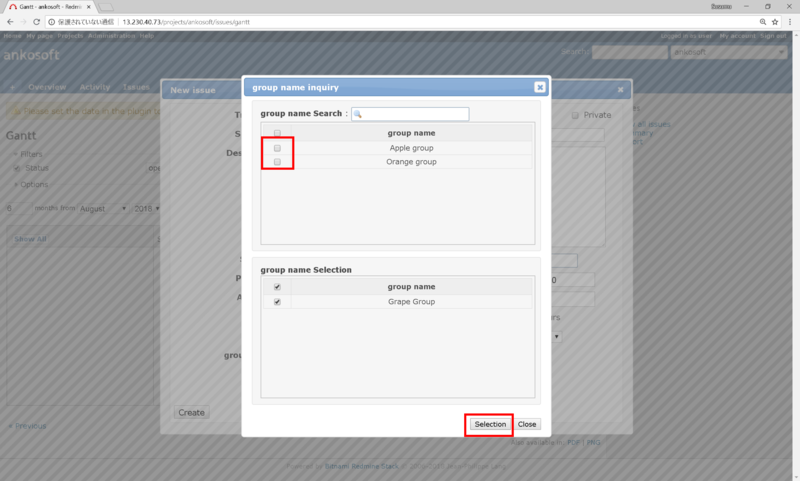 You can close or open Tree-View of issues by simply clicking the “-” and “+” icons. If you click the button, all Issues will open. 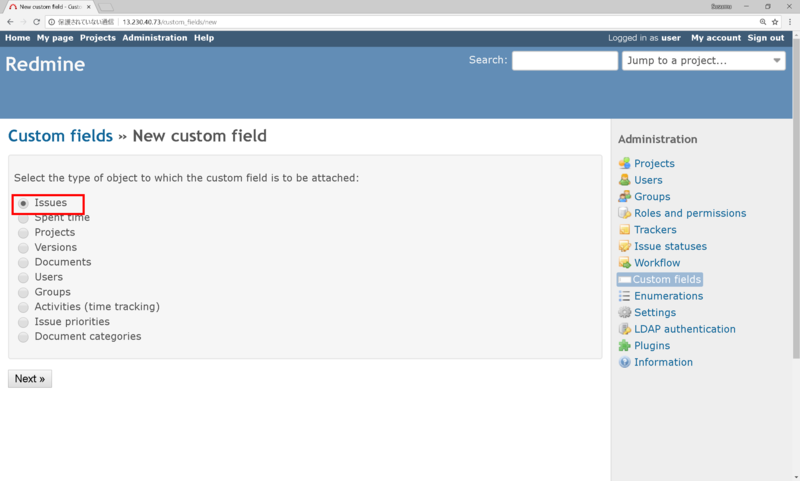 If you click the number button, Issues in the same hierarchy are displayed. 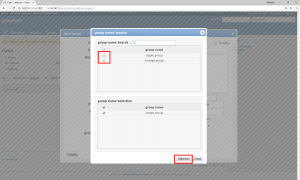 It is possible to display guidelines. 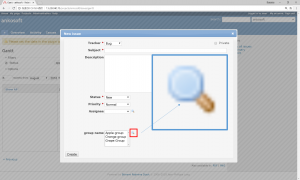 This makes it easy to identify the title of the ticket, due date and the position of the Gantt chart, etc. You can check the number of weekdays in the period field. 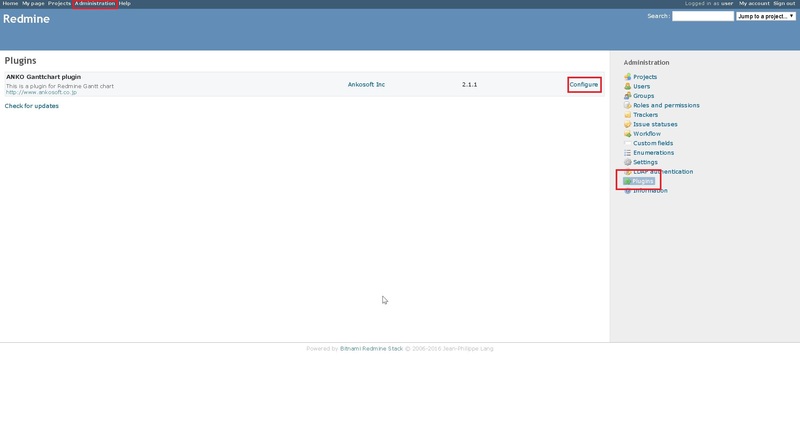 By clicking the period field, you can change the number of periods. 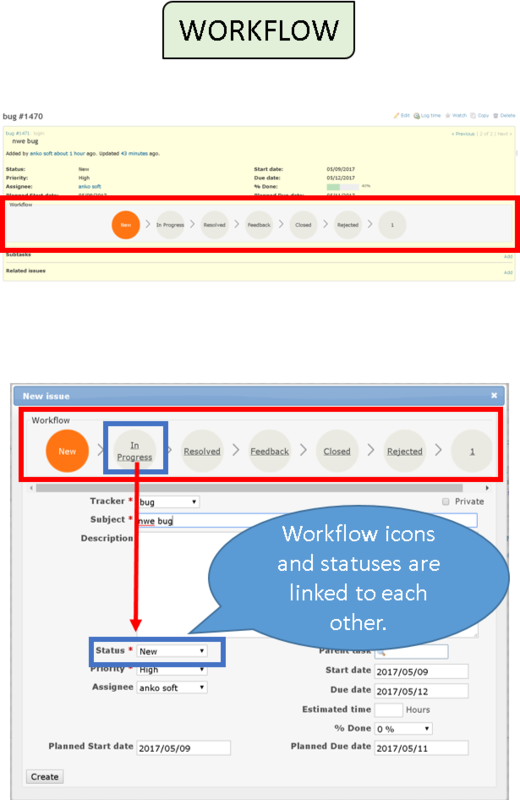 We provide a workflow display function that can visually confirm the status of the issue. You can easily grasp what the next status is without having to click the status select box. 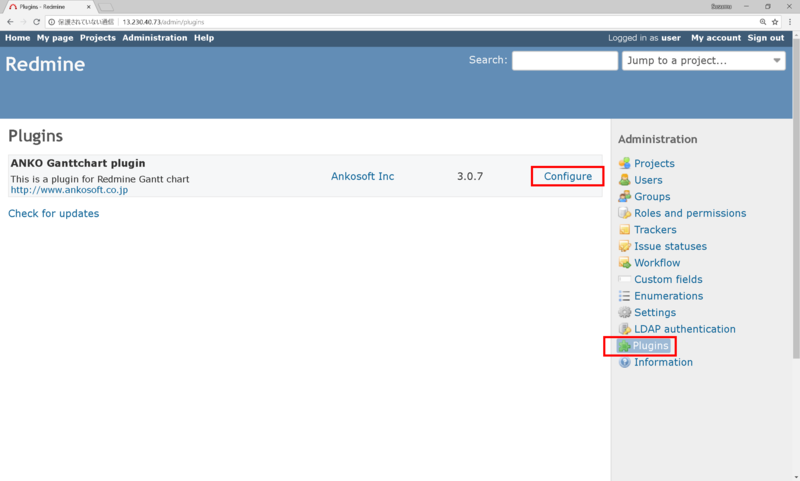 You can also change the status of the issue by clicking the workflow display icon. 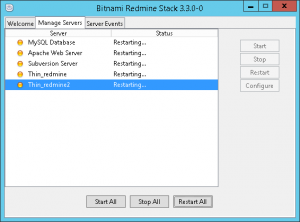 This will allow you to change the status of issue with a single click. It shows that it is a holiday with a gray background color. When you move the mouse to the day of the week part, the holiday name is displayed. 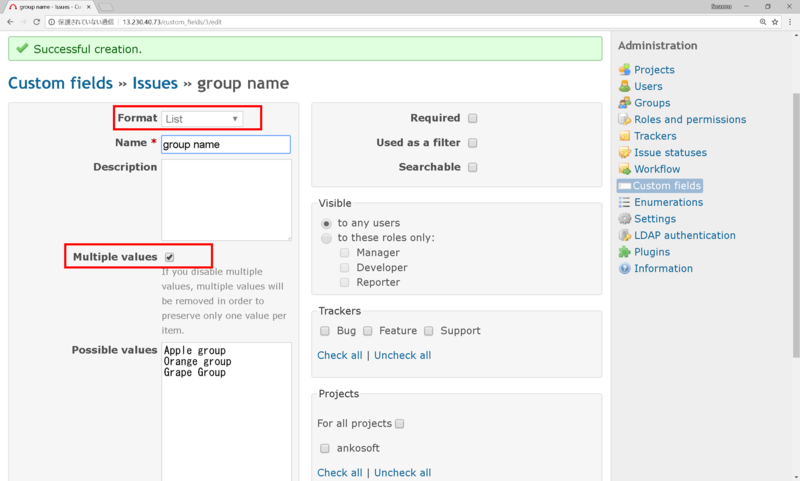 You can freely add trackers to classify issues on Redmine. 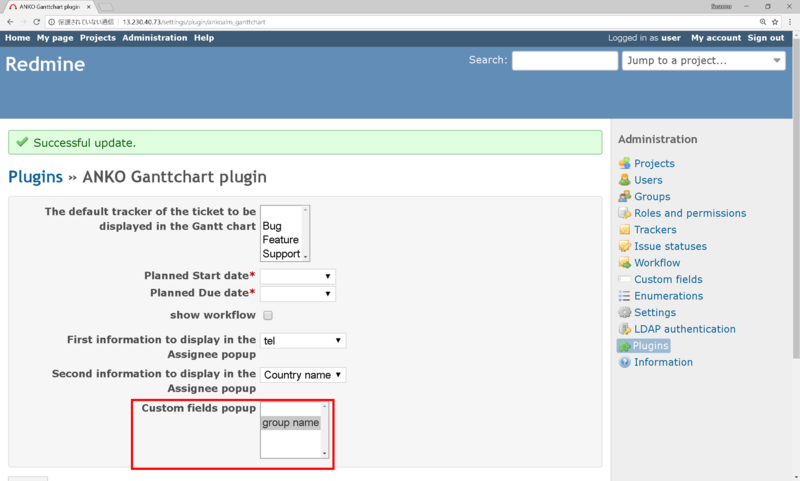 As a result, if unnecessary issues on the Gantt Chart page show, it will reduce readability. 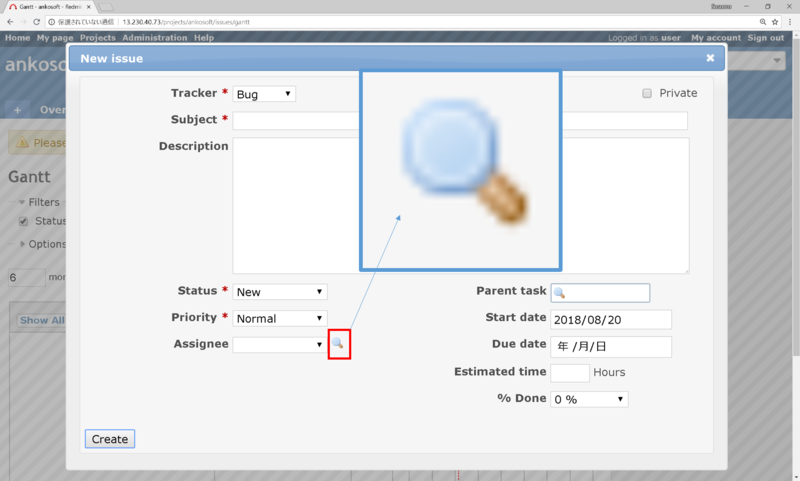 By registering the tracker you want to show on the Gantt chart page in advance, you can show only the necessary issues on the Gantt chart page. 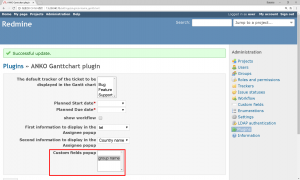 Redmine Gantt chart cloud show one chart with one issue based on Start and Due dates of issue. For that reason, you cloud not confirm the original plan’s date information after Start and Due dates of issue were corrected. 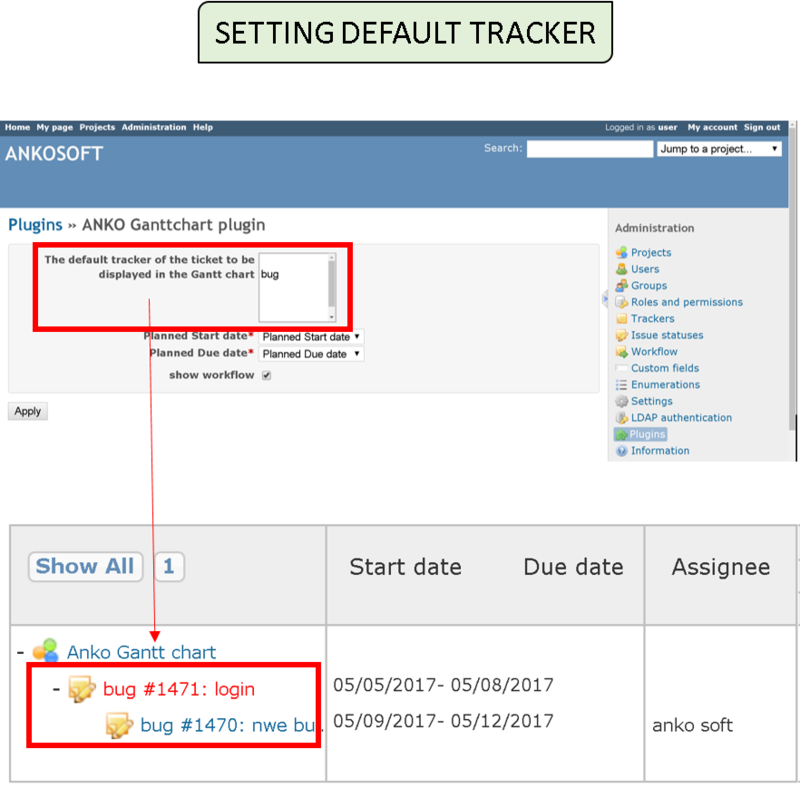 ANKO Gantt chart can show two charts with one issue. 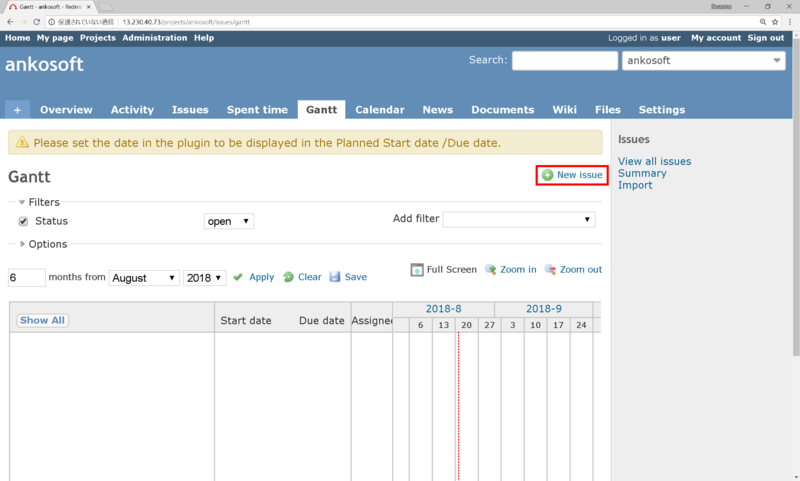 Therefore, you can confirm the estrangement of progress from a schedule in visual way with showing scheduled Start and Due dates at the plan stage. A thick line shows a Start and Due dates of an actual issue, and a thin line under it shows scheduled Start and Due dates. 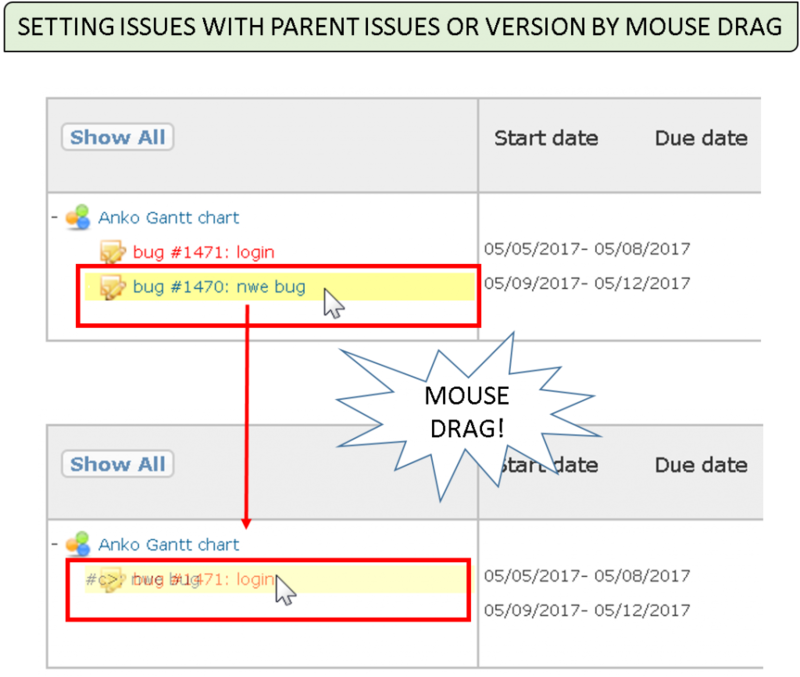 You can set issues with Parent issues or version by mouse drag, so you can check or build up the hierarchy or structure of issues very easily. 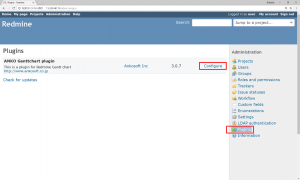 if you click mouse right button, popup sub menu, and you can resolve relationship with Parent task or version. 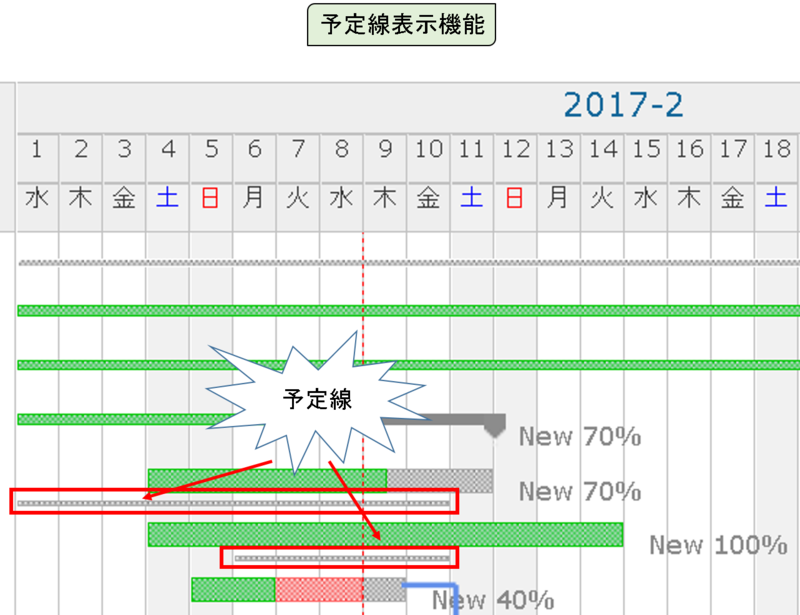 You can check the most important information of “when”, “who”, and “what” in project schedule management on Gantt chart page. 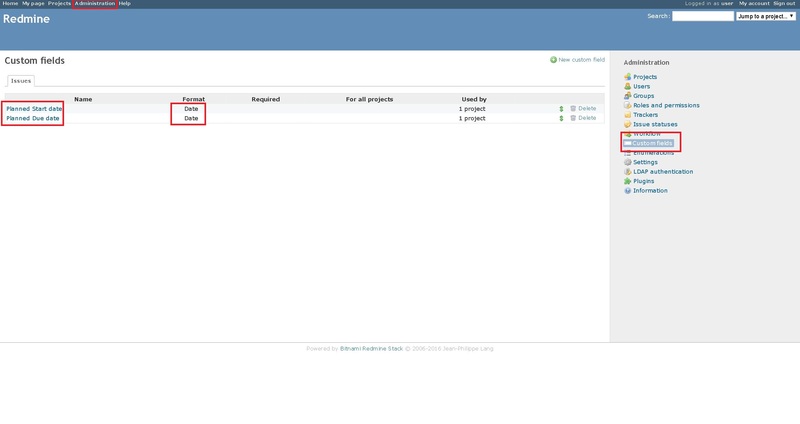 · “Start date” and “due date” are displayed to the right of the issue name as information on “WHEN”. 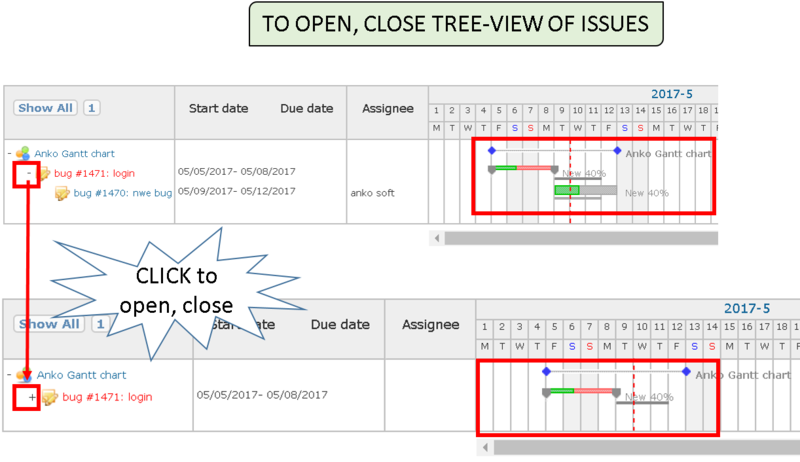 Even if you can not see the graph on the Gantt chart, you can check the “start date” and “due date” of the issue. In addition, since DAY is displayed on the day of the week, it is possible to intuitively grasp the schedule. 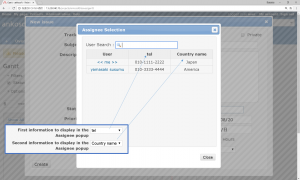 · “Assignee” is displayed as information on “WHO”. Move the mouse over the border of the issue title column, date column, Assignee column, and drag the mouse to adjust the width of its. 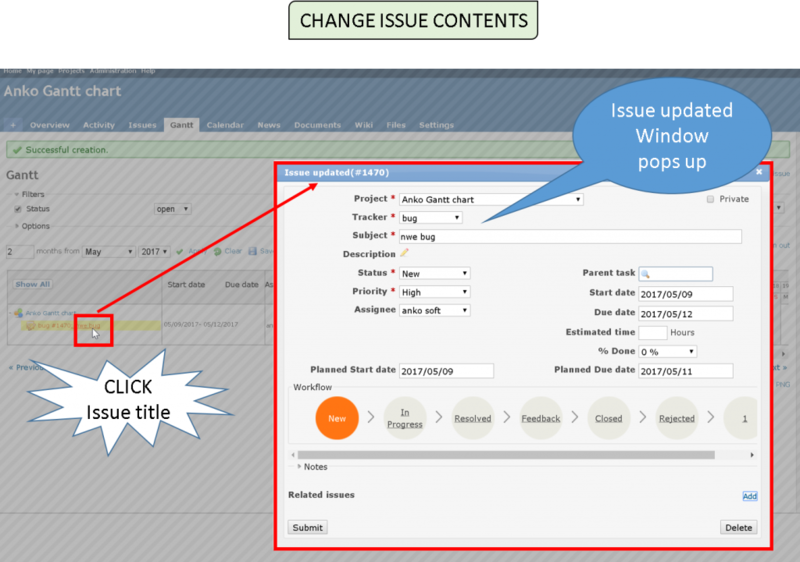 You can also expand the display area of the Gantt Chart by narrowing the issue title column, date column, Assignee column. When there are many issues, it is necessary to scroll the page vertically, but when scrolling, the date part at the top of the Gantt chart is not displayed on the screen, so the date can not be confirmed was inconvenient, but this function You can solve it. 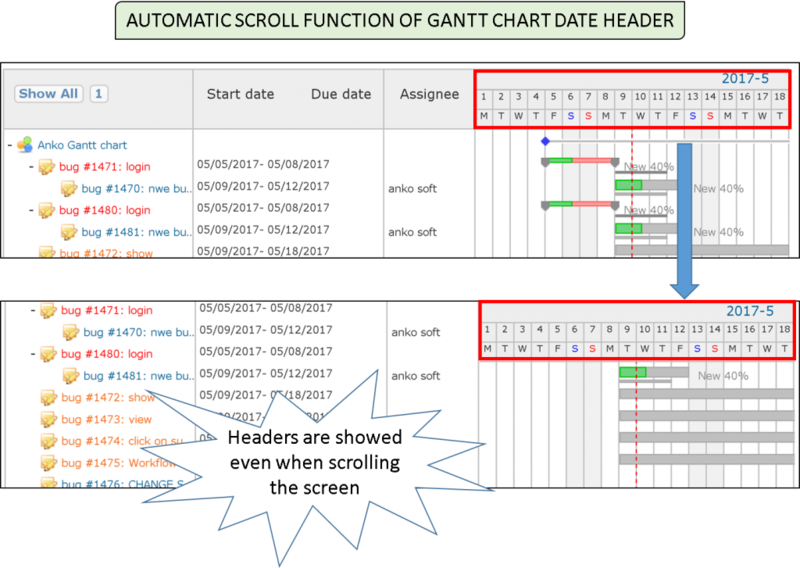 If you scroll the page vertically, you can scroll the header part of the Gantt chart’s date automatically and check the date at any time. 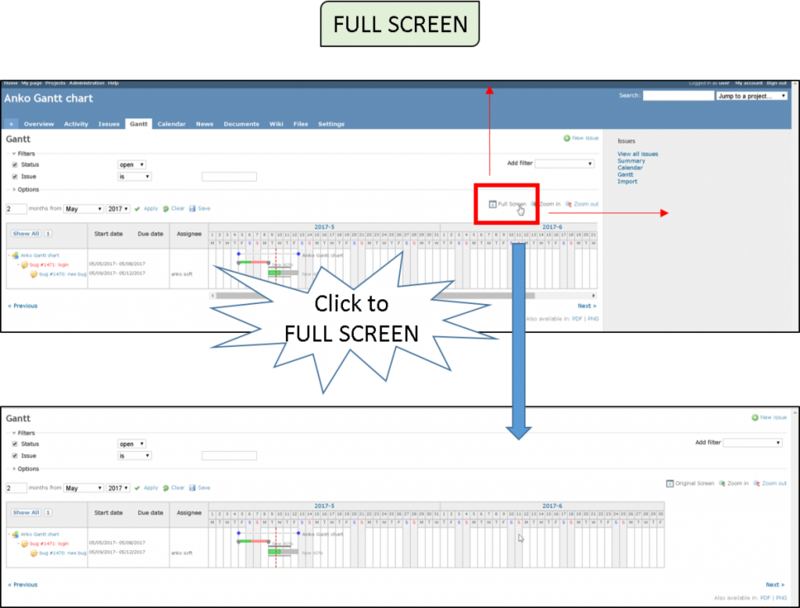 If you want to expand the Gantt Chart drawing area, click the “Full Screen” button. 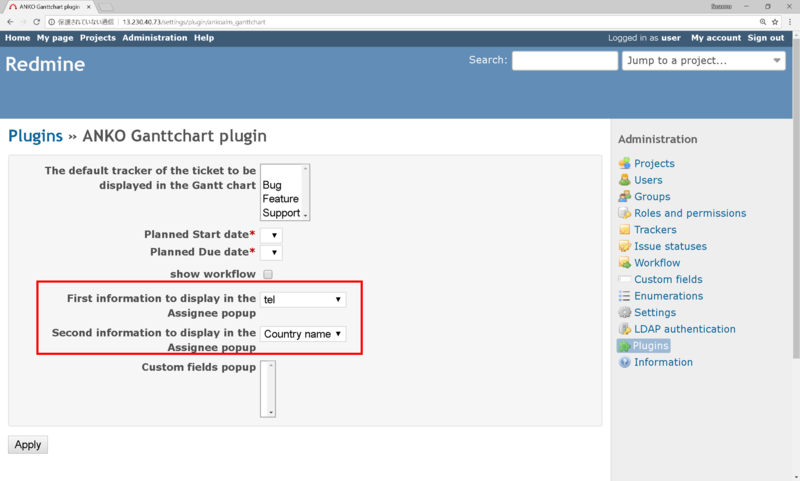 The sidebar area and the header menu area disappear, and the Gantt chart page displays on the full screen. Clicking on the “Original Screen” button to return to the original screen easily. 7. 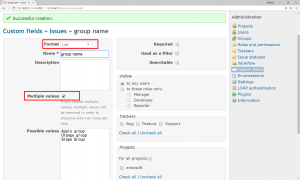 “Projects”->”Gantt”->”New issue”->”Assignee”->”Magnifying glass icon” click, then “Assignee Selection” popup with user’s information. 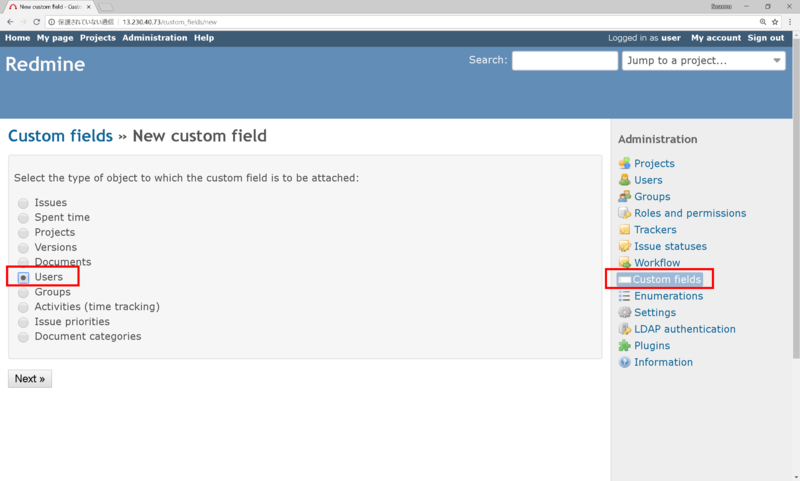 8.Please make Issues’s Custom fields : “Custom fields”->”New custom field”->”Users” as List Format with Multiple values ON. 10. 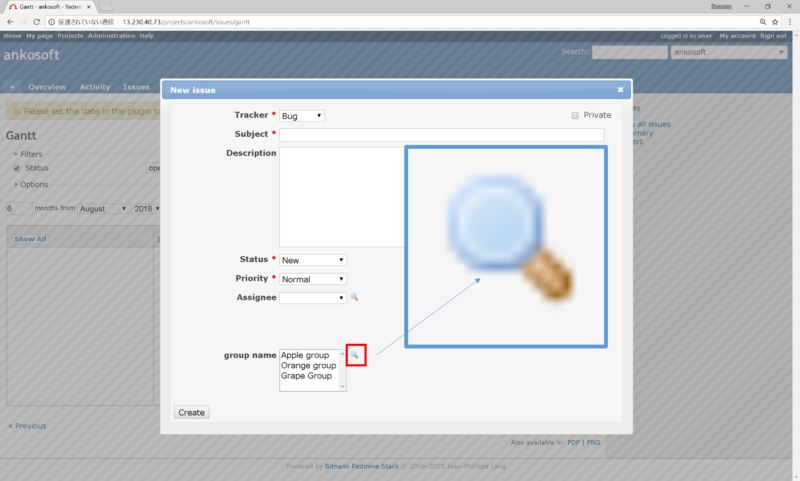 “Projects”->”Gantt”->”New issue”->”Magnifying glass icon” click, then popup to select. Payment method: Bank transfer , credit card by PayPal. $ 800 is the plug-in unit price , installation of plugin, technical assistance support are not included. 1 . Please contact us from the form or e-mail. 2 . We offers you the evaluation version limited period of use. 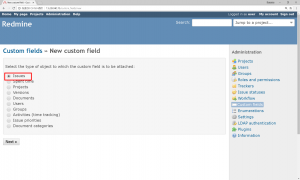 You can evaluate on your server. 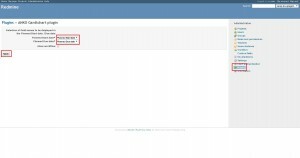 Please check and whether there is no conflict with other plugins. 3 . 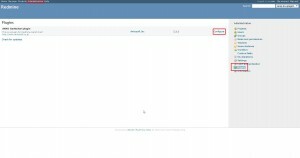 After confirming the payment, we will sends the product plugin you within 5 days. Copyright ⓒ Ankosoft Inc. All rights reserved.